Tokyo by Food offers a variety of Japanese cooking classes and food tours throughout Tokyo held by English speaking locals. Explore your favorite area and learn what secret food spots it has to offer or learn how to make your favorite Japanese dish! Is sampling all kinds of delicious Japanese food one of your main objectives during your trip to Japan? Would you like to know the best places to eat in a certain area in Tokyo or learn how to make some traditional Japanese delicacies yourself? Then you should check out Tokyo by Food, a new media platform for all those interested in Japan's food culture! What is Tokyo by Food? Tokyo by Food is a company founded with the wish to introduce delicious Japanese food to people visiting Tokyo. They collaborate with various companies and individual cooking instructors to offer food tours as well as cooking classes. There are various types of food tours available and you can choose by area and interest. You can experience the famous Tsukiji Fish Market, a variety of izakayas (Japanese bars), local food from all over Japan or a whole tour focusing on ramen. At the cooking classes, you'll learn how to prepare traditional Japanese food. The list of dishes you can learn to make includes wagashi (traditional Japnese sweets), ramen, gyoza dumplings and sushi. Most classes only take a couple of hours but you can also take courses that teach you something different every day. If you are a vegetarian, Tokyo by Food also offers classes where you can learn to make Buddhist cuisine as well as vegetable sushi classes. Both of these options as well as their wagashi class are vegetarian and vegan-friendly. Tokyo by Food has teamed up with Ayn Soup Kitchen to help feed children in Cambodia. For every person who joins a cooking class or a food tour, Tokyo by Food donates money to feed ten children during their lunch. This way you can enjoy delicious food while also helping others to fill their stomach. At the Wagashi Class, you can learn how to make three kinds of traditional Japanese sweets: tofu warabi mochi, ichigo daifuku, and nerikiri, which we introduce below. The class is lead by Mrs. Miyuki who used to live and work overseas and is fluent in English. Warabi mochi is usually made from bracken starch. Bracken in Japanese is warabi, that's why it is named warabi mochi. However, this is the easier version made with simple ingredients you can get in most countries: tofu and potato starch. The ingredients are mixed on low heat until they reach a firm consistency and afterward cooled down in iced water. The mochi is cut and served with kinako (roasted soybean powder) and kuromitsu (brown sugar syrup). It's a simple but delicious dessert! Ichigo Daifuku is a typical winter and spring treat in Japan. It is a combination of red or white anko (bean paste) and sweet rice cake. First, you remove the leaves from the strawberry and cover everything but the tip in anko. Then, you make the mochi with mochi powder, water, and sugar. It can be easily prepared in the microwave. Cover the strawberries and the anko with a layer of mochi and it's ready. The perfect mixture of the different textures makes this one of the most popular Japanese sweets for locals and visitors alike. 3. Nerikiri Wagashi - Almost too Beautiful to Eat! Probably the most intriguing dessert you will learn in this class is nerikiri wagashi made from white bean paste. White bean paste is smooth and easy to mold and color, so it's perfect to use to make true works of art reflecting the features of the current season. Nerikiri wagashi consists of the core and the outer layer. You can flavor the bean paste for the core with anything your heart desires. In this case, we used pickled cherry blossoms and matcha green tea. The outer layer of the bean paste can be colored and shaped according to what you would like to create. In this class you can choose between natural colors such as pumpkin and purple eggplant powder or artificial food coloring. You will be given a variety of utensils similar to very small cookie cutters and pearls made of sugar to decorate the nekiri wagashi however you want. Nerikiri wagashi is a great creative outlet and the resulting pieces of art will always be almost too pretty to eat. The Allstar Food Tour is a three-hour tour between Ginza and Shimbashi introducing you to Japanese bars, restaurants, and traditional Japanese snacks. The tour guide will teach you simple Japanese phases and provide you with information about the places you visit. This tour includes some places that specialize in food from a certain region of Japan, so it's a great way to get to know some delicacies from outside of Tokyo as well. After a couple of short food stops, you will settle down at a full table at a Japanese bar while bonding with the other people joining the tour. 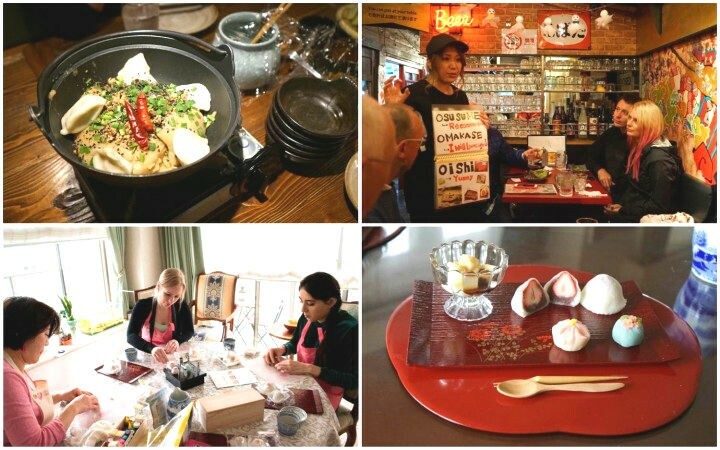 This tour is great for those who want to enjoy the great variety of food that Japan has to offer while spending a fun evening meeting new people. Tokyo by Food - Sample Delicious Food and Meet New People! Tokyo by Food offers a great variety of food-based events for every budget and interest. It doesn't matter if you have a sweet tooth and want to learn how to make your own Japanese sweets, a vegetarian wanting to learn how to make vegetarian options of traditional Japanese meals or someone who just wants to explore restaurants and meet new people, Tokyo by Food will have a suitable option. You can check all the available tours and courses at https://tokyobyfood.com/. 10 Unique Cafes In Tokyo - Where A Coffee Break Becomes An Experience!